This page is copyright 1996, 2001, 2002, 2005, 2006, 2009 Tim Rassbach. First used to recover a poison gas canister in issue #218. 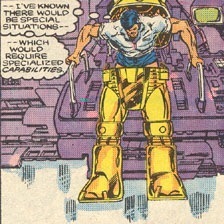 After his battery of suits was destroyed to keep them out of the wrong hands (issues 174-175), Tony knew there’d be special situations that would require those special capabilities and he began to replace them. 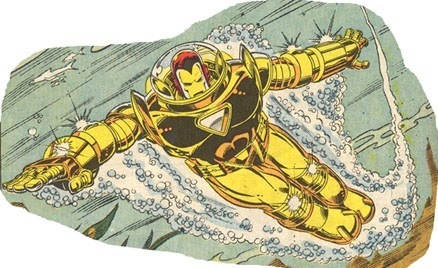 While Iron Man’s conventional suits functioned underwater, they were noisy, inefficient, and they leaked. Plus, they weren’t able to go to great depths nor could they stay under for long. So Stark designed his experimental deep sea armor, the Deep Submergence Suit, or Hydro Armor, Model XIII, Mark I. 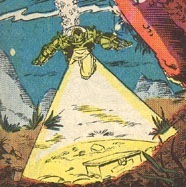 The large and bright yellow massive suit is cumbersome and clunky on land, but subtle and graceful underwater. The armor is a tougher, thicker composite of his usual armor material. Rated at 8,000 lbs./inch, it is capable of traveling to depths of up to 3 miles. Iron Man wears a normal helmet, but is also encased within a quartz visor/dome that provides a full oxygen environment. The dome, a transparent headpiece, is made from a new aligned-crystal technology (normal glass would never have worked at the depths this suit was designed to work in). The Special Feature on this suit: An Inner-Escape Suit. 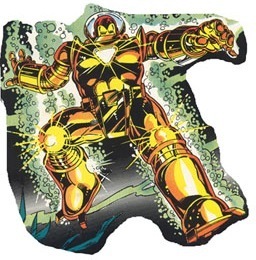 Built in case, Iron Man was ever trapped in debris during a salvage operation, this armor within an armor allows Iron Man to jettison his outer armored shell in emergencies and shoot to the surface in the smaller back-up suit. This Escape Suit can withstand the pressure of the deep sea, but only for a short time (mere minutes). It also has limited capabilities and range. The storage bay on the back of the Hydro Armor—for retrieval of artifacts—is attached to the Escape Suit, so it goes with Iron Man wherever he goes. To ensure that scavengers don’t get their hands on the abandoned armor, launching the escape sequence triggers a massive self-destruct charge. Armaments: Tunable Tri-Beam; Repulsors; Mini-Torpedoes (fired from shoulder epaulets; look like flying wings); and a few specialized sub aqua defense mechanisms: an octopus-inspired Ink Smokescreen and an electric eel-like Shock Weapon. While the gloves feature advanced micro-hand articulation for tight work, the boots are really ingenious. First, they are immobile, meaning his feet/ankles don’t flex like his normal boots. Next, the boot design features dual mode boot jets. They breathe air for flight, but when underwater, silent water impellers engage to provide movement. Driven by micro water impellers, which have no obvious moving parts: water is drawn in and squirted out to propel the armor silently. Three steering jets per boot prevent “fish-tailing.” Model XIII is like the stealthiest of submarines in a vastly smaller package. 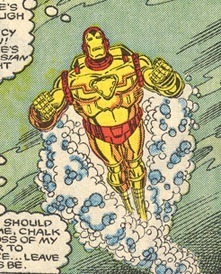 Since the Hydro Armor was designed for such a harsh (not to mention dangerous) environment, the oxygen flow, electrical relays, aquatic propulsion jets, and other systems were backed-up with every safeguard Stark could think of, preparing for every conceivable contingency—including power supply. The power source is a Mark IV micro-nuclear supply pack. The suit has a refined Tri-Beam configuration, featuring advanced tunable lasers—a design necessary when building a weapon for atmospheric and oceanic penetration. The Tri-Beam also has an advanced halogen lamp spotlight. On his yacht, The Bethany, Tony has a special bay from which he can deploy the aqua armor. The suit has full-spectrum radio communications. In addition, there are specialized sensors for the unique conditions of the water. On-board sonar allows Shellhead to maneuver without light when necessary.